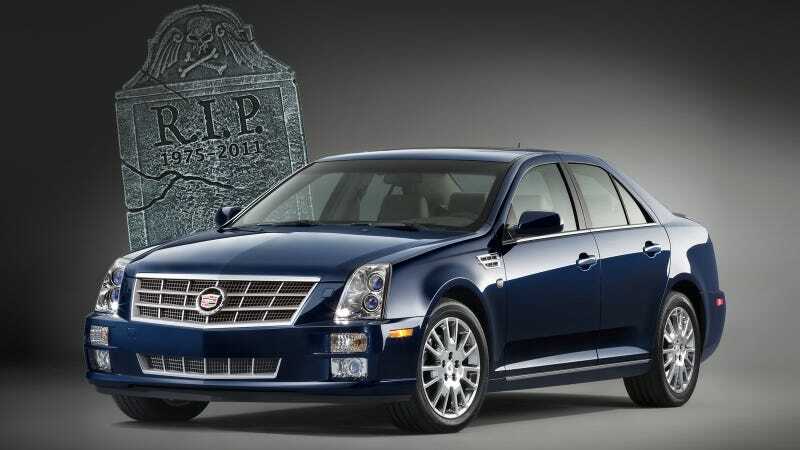 The last Cadillac STS has quietly left the company's Lansing plant, and we can't help but feel sad for Caddy's middle child. Because although the mid-sized Cadillac was once an important car, now it just needed to die. By the mid-1970s, German cars were on their way to owning the suburban upper-middle class. Where prior generations had built entire careers on attaining the proverbial block-long Sedan deVille, mainly in white, black or silver, professional baby boomers were grabbing up whatever bronze-hued Benzes, Porsches and BMWs they could get their strivey little hands on. Cadillac? Sure, my Scotch-drinking, Nixon-voting parents had one of those. Screw that noise, and mix me a tequila sunrise. The rising prestige of smaller luxury cars from overseas was only partly due to the gas shocks after the 1973 Yom Kippur War. The 1960s counterculture's contempt for large, wasteful American cars had, by then, gelled into a generational bias, particularly among the new, younger elites — the early-blooming coastal professionals of the 90th economic percentile. We know them now as Yuppies, but back then, they were just those annoying people who wore plaid, hogged the backgammon tables and snorted coke till all hours. Cadillac product planners had already read the writing on the country club walls, and a smaller, more cosmopolitan Cadillac was in the works. By 1975 the new Caddy rolled into dealerships, with a squat, muscular elegance and a trippy, angular comportment. Of course, many were painted in the same earthy tones as the Germans' own, which signaled to younger, affluent buyers that Detroit wanted their business. The first-gen Seville was a very good car. It was built largely on the company's downmarket X-Body platform, but engineers modified the underpinnings for a fittingly luxurious ride and far tighter handling than anything else on the Cadillac lot. And even though it was more expensive than many in the Cadillac family — at nearly $12,500 list — it moved well, averaging around 50,000 units per year for its entire four year run. For gen-two, Cadillac tried a quirkier shape to match the 1980s' warped traditionalism, with a faux, nouveau-Rolls-Royce rumble-seat bulge in the rear (the slantback). The updated Seville rode on GM's new front-wheel-drive K-body platform, which would carry it through the 1990s. And it was a disaster, suffering serious quality issues, some of the least-powerful V8s in history, and trendy engineering fumbles like the 8-6-4 cylinder-deactivation engine and GM's infamous diesel V8s. The third gen Seville was smaller and even less appealing when it arrived in the late '80s. Sales tanked, as buyers of $40,000 cars continued to stray toward BMW dealerships, leaving the odd little Cadillac notchback sedan to a few, and ever-waning number of diehards. Cadillac had been distracted by the Allanté (the Cadillac so expensive it was given an accent), a gravely ill-considered potshot at the Mercedes 560SL that landed with a $50,000 splat. In 1988, Cadillac introduced the Seville Touring Sedan package (recognize those initials? ), which including GM's FE2 Touring Suspension. In three years, the company never sold more than 2,500 of the Seville STSs. If it wasn't obvious GM had lost the plot during gen-two, gen-three spelled failure like a Times Square-sized neon billboard on fire. And then came the Northstar System, a quad-cam 32-valve aluminum V8. It was a huge engineering gamble that paid off big, boosting the fourth-gen Seville back into performance respectability. Indeed, with all that crazy Allanté money written off the books, Cadillac found itself with some extra scratch for a comeback by the late 1990s. The fifth-gen Seville added Delphi's MagneRide adaptive suspension system, the latest version of which is now standard equipment in several Ferraris, the Corvette ZR1 and the Cadillac CTS-V. Horsepower on the Seville STS reached 300 hp. With the drivetrain and suspension nuts fully cracked, Cadillac needed an appealing shape to win the naughts. Betting against the "retro" movement, Cadillac designers found their way forward in the angular, postmodern "Art and Science" language that still define Cadillac's visual signature. For the 2005 model year, GM retired the Seville, naming its successor the more succinct (but less evocative) STS. It had the Northstar goodies under the hood, and GM returned its drive wheels to the correct position, placing it atop GM's rear-wheel-drive Sigma platform. Sales peaked that year at 33,500. And so it was that the STS helped bootstrap Cadillac's march toward relevancy, as the 469 hp STS-V aided in recasting Cadillac as a hybrid of muscle-car performance and Euro-land luxury. More than that, it gave Shanghai GM something to lengthen, and the long-wheelbase version, christened SLS, found modest success in both China and the Middle East. But now, with Cadillac's new flagship on the way, a long-wheelbase STS would be a redundancy. And with STS sales having dropped steadily throughout its run, the model never mounted a serious threat to the Germans' ownership of the upmarket midsize luxury space. In the meantime, lest we forget, the Japanese had turned the entry-luxury space into its own cash machine. Cadillac never found a compelling way to differentiate the STS — other than design — and wound up trying to live in both worlds: the Japanese luxury world and the German luxury world, and finding little success in the middle. Also, while GM was sleeping, the world had changed. The modern version of those tequila-swilling Yuppies from years' past had turned to SUVs to cart around their golf bags. It wasn't a loss for Cadillac, though, which quickly put GM's full-sized SUV platform into full effect with the Escalade. Add one to the win column. Indeed, if ever there was a time to cut bait, it's now. The XTS will take the STS's place in far-flung luxury markets, while Cadillac's hoping the smaller ATS will be its charming third-try success in small luxury cars. And, of course, the company is planning a return to the full-sized luxury-sedan space that it gave up years ago to focus on smaller cars like the Seville. Yes, and the cycle continues.